Western blot analysis of extracts from THP-1 cells, untreated (-) or stimulated (+) with a combination of treatments as indicated, using MSR1 (D8K4E) Rabbit mAb (upper) and β-Actin (D6A8) Rabbit mAb #8457 (lower). 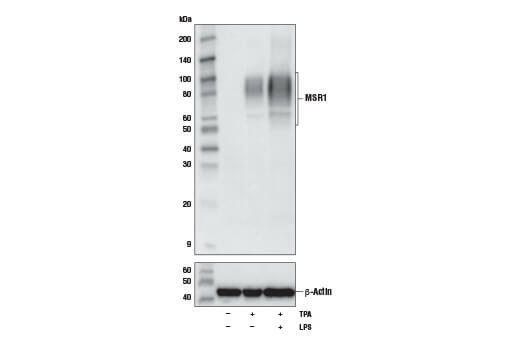 MSR1 (D8K4E) Rabbit mAb recognizes endogenous levels of total MSR1 protein. Monoclonal antibody is produced by immunizing animals with a synthetic peptide corresponding to residues surrounding Leu319 of human MSR1 protein. Macrophage Scavenger receptor types I and II (MSR1, and also known as SCARA1) are members of the class A macrophage scavenger receptor family. These proteins bind large quantities of modified lipoproteins and promote endocytosis. Upregulation of MSR1 in infiltrating myeloid cells may mediate clearance of specific damage signals in response to tissue injury, including ischemic stroke (1). MSR1 germ line mutations are also associated with increased prostate cancer susceptibility in some patient cohorts (2). MSR1 is observed to be upregulated in differentiated THP-1 cells (3). Shichita, T. et al. (2017) Nat Med 23, 723-32. Miller, D.C. et al. (2003) Cancer Res 63, 3486-9. Chen, Y. et al. (2011) Blood 118, 390-400.